I've been commissioned to build a quarter sawn oak breakfront bookcase by a client that I've worked with in the past. It will be made in what I might call a Georgian vernacular style. Its main divergence from historical examples is that it will have two slides on the left and right at the waist molding to occasionally support a small flat screen television. This idea is borrowed from French Bureau Plat slides that date from the same period. Among other things I thought a blog might be an opportunity to explain my building process and how I work with clients to make various things come to life. Usually people have an idea of what they want and I work with them to find the best historical examples to choose from or to have as a starting point for deciding on things they like and dislike. In this particular case there was a piece of furniture in the room that will hold this bookcase. The oak English chest that influenced this bookcase has a frame and panel construction and the raised panels have a particularly deep fielded panel. I rather liked that so we decided on frame and panel sides and lower doors with glass upper doors. The piece will have a base, waist moldings and a cornice. 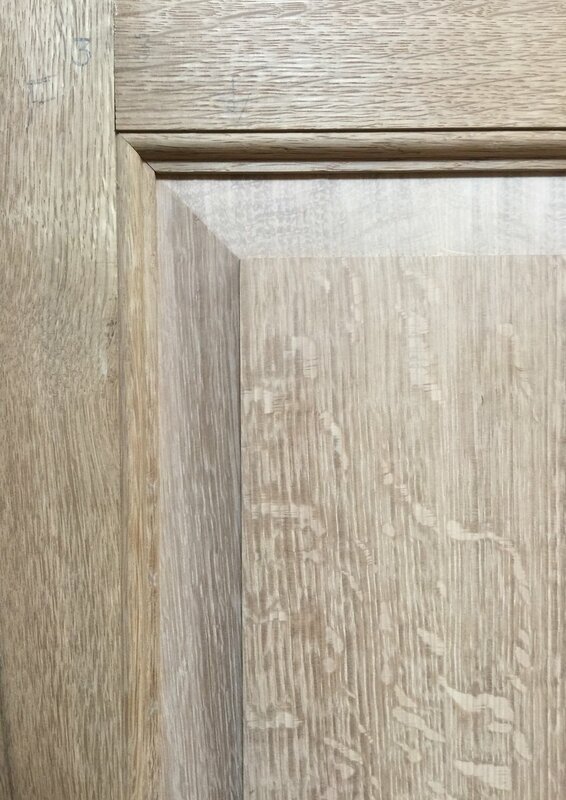 I will use traditional joinery throughout, all cases will be dovetailed and all doors and frame and panels will be mortised and tenoned together. The hardware will be made in England and I'll use a traditional shellac and wax finish. I always start with a hand drawing, usually full scale but because this is a large piece I've drawn it half scale. Once approved I can settle on a price since I certainly need to know exactly what I'm making before I can have an idea of what it will cost. I then select the best materials I can find and mill all the parts to size. No plywood is ever used. I hand plane all the joints to form each panel. A piece like this has around 40 panels made up of 2 to 3 pieces, a lot of hand planing. The doors and other frame and panel elements have an interesting molding that I custom milled and the framing elements are mortice and tenoned together. The inside of the panels are flush with the frames so that books can easily be slid in and out without catching on anything. I started this project a few months back and I'm beginning to cut dovetails at this point. I have made all of the frame and panel units and doors as well as the tops and bottoms of each case. More to come. 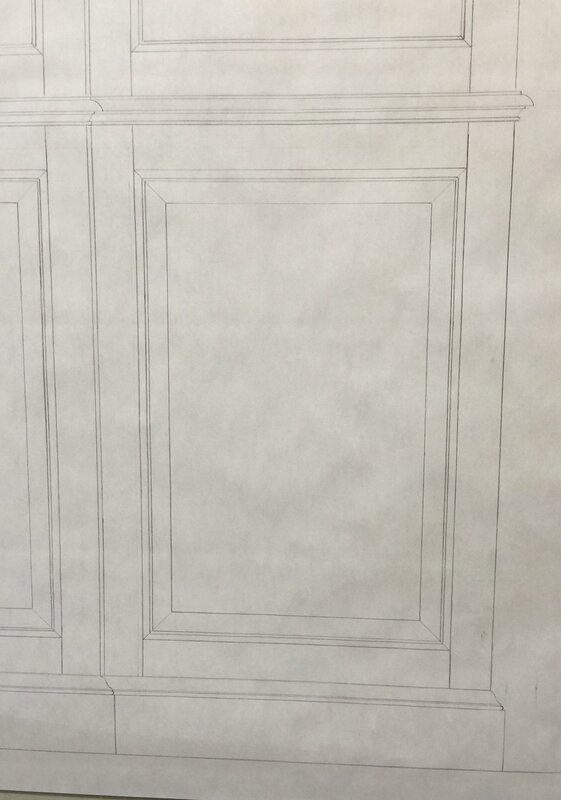 Detail of drawing of the lower right door and waist molding and base. Detail of the drawing showing the upper right side and cornice of the breakfront bookcase. Frame and panel detail of the bookcase showing nicely figured oak and moldings made to match the English chest that inspired this piece. The English chest that inspired the design of this project. Laying out dovetails for the construction of each case. Using a cutting gauge to mark the length of of the tails. This breakfront has six separate cases. Laying out the tails, the "x" shows the area to be removed for the pins. My general assortment of tools for dovetailing, left to right cutting gauge, dovetail saw, chiseles and a skew chisele. My layout tool is beneath the chisels.